Info "Even germs need a chance to relax. I want to go for a swim in the beaker!" Weird Science is one of Kat and Ana's microgames in WarioWare: Twisted! 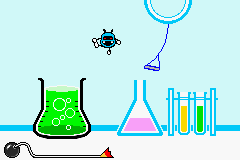 The purpose of the game is to make the Virus jump into the beaker by pressing the moment it is close to the beaker. 1st level difficulty: The beaker's opening is large. 2nd level difficulty: The beaker's opening is medium. 3rd level difficulty: The beaker's opening is small. This page was last edited on September 19, 2018, at 21:26.